The top trace (and scope trigger) is the GPS-locked 10 MHz reference, the lower trace is the AD9850 DDS output (not through the MAX4165 buffer amp, because bandwidth). If the frequencies aren’t identical, the DDS trace will crawl left or right with respect to the reference: leftward if the DDS frequency is too high, rightward if it’s too low. If the DDS frequency is way off, then the waveform may scamper or run, with the distinct possibility of aliasing on digital scopes; you have been warned. The joystick acts as a bidirectional switch, rather than an analog input, with the loop determining the step increment and timing. The ad-hoc axis orientation lets you (well, me) push the joystick against the waveform crawl, which gradually slows down and stops when the offset value makes the DDS output match the reference. The lurid red glow along the bottom is lens flare from the amber LED showing the relay is turned on. The slightly dimmer characters across the middle of the display show how the refresh interacts with the camera shutter at 1/30 s exposure. N.B. 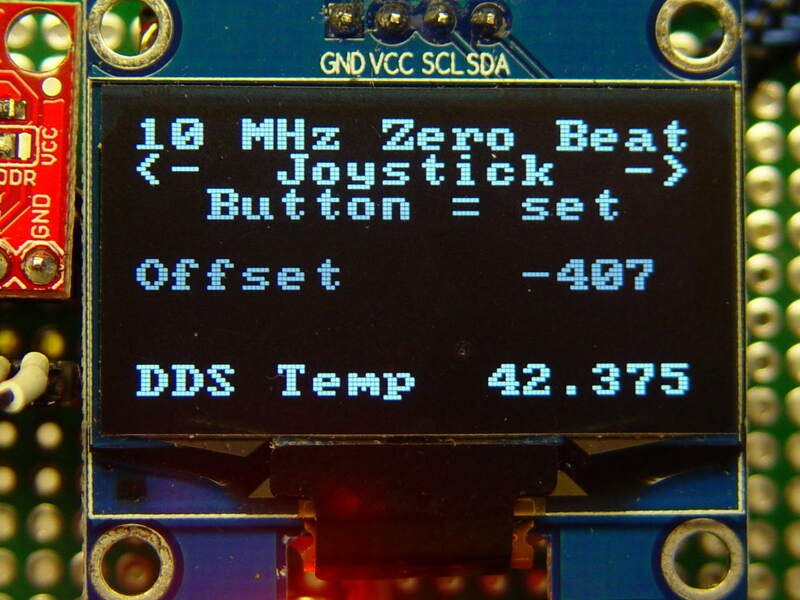 : Normally, you know the DDS clock oscillator frequency with some accuracy. Dividing that value into 232 (for the AD9850) gives you the delta-phase count / frequency ratio that converts a desired DDS output frequency into the delta-phase value telling the DDS to make it happen. In this case, I want the output frequency to be exactly 10.000000 MHz, so I’m adjusting the oscillator frequency (nominal 125 MHz + offset), calculating the corresponding count-to-Hz ratio, multiplying the ratio by 10.000000 MHz, stuffing the ensuing count into the DDS, and eyeballing what happens. 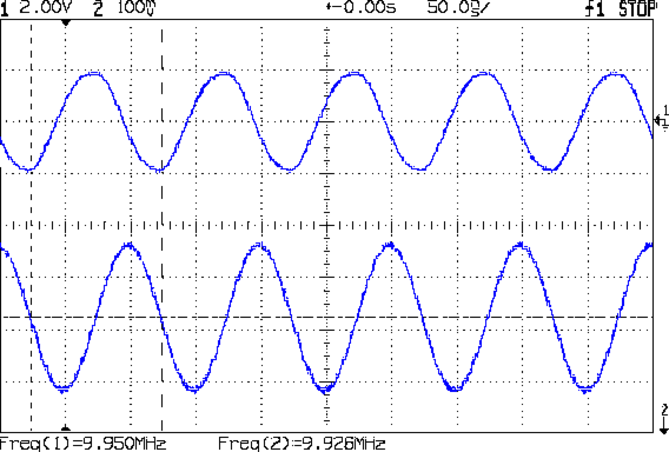 When the oscillator frequency variable matches the actual oscillator frequency, then the actual output will 10.000000 MHz and the ratio will be correct. Got it? Took me a while. Although the intent is to tune for best frequency match and move on, you (well, I) can use this to accumulate a table of frequency offset vs. temperature pairs, from which a (presumably simple) formula can be conjured to render this step unnecessary.